Dr. Seuss's birthday is on March 2nd and so this week is SEUSS WEEK for our Weekly Virtual Book Club for Kids! We love making Thing 1 and Thing 2 Puppets, making fizzy footprints, and doing Cat in the Hat themed science. Today we are reading Wacky Wednesday and trying out some wacky painting ideas! 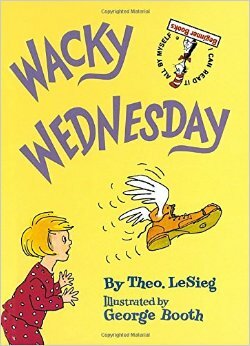 Wacky Wednesday by Dr. Seuss is such a fun book to read! Each page contains some errors and you practice counting while you try and find them! My kids LOVE this book! 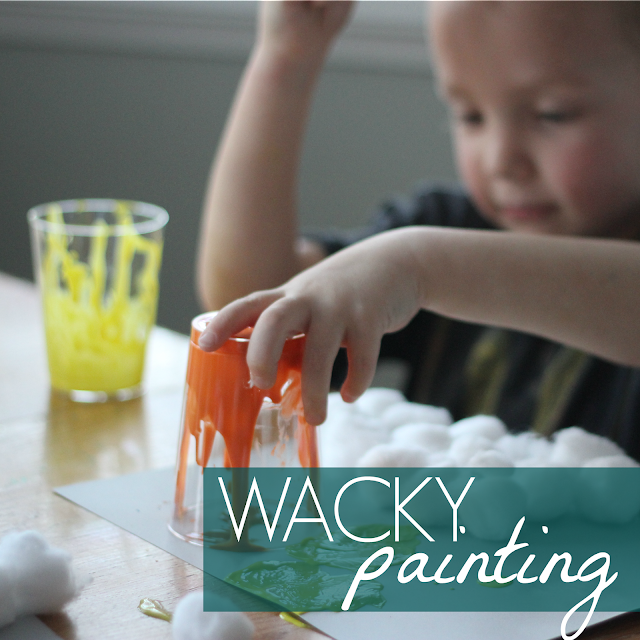 Since the book was filled with wacky things, we are trying out some wacky painting! Scroll down for details! To get started we filled up cups with paint and a little bit of water to help make the paint thinner. Next we started painting on different surfaces using different materials! My daughter loved dripping paint using a plastic spoon. After she dripped it onto the paper, she turned it sideways and let gravity pull it different directions. It was neat to watch the colors mix and flow. My son loved doing drip painting with cups. 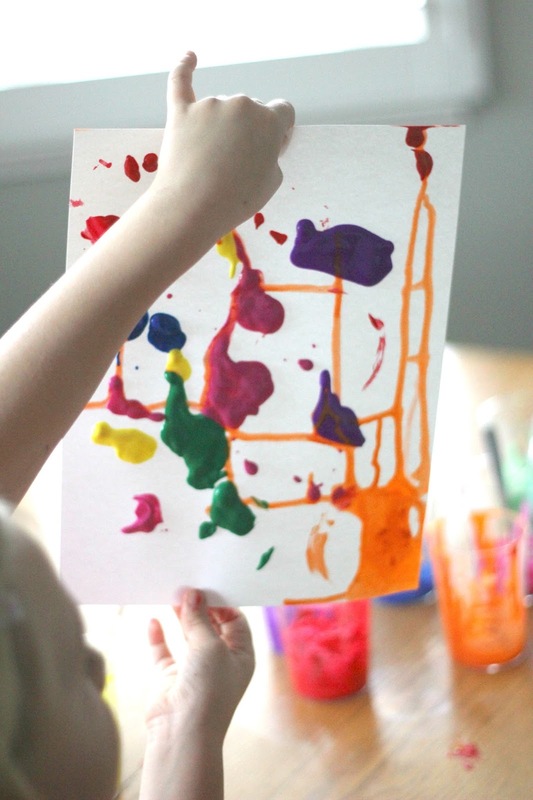 He would bang the cups and move them around and just let the paint drip from inside the cup onto the paper. 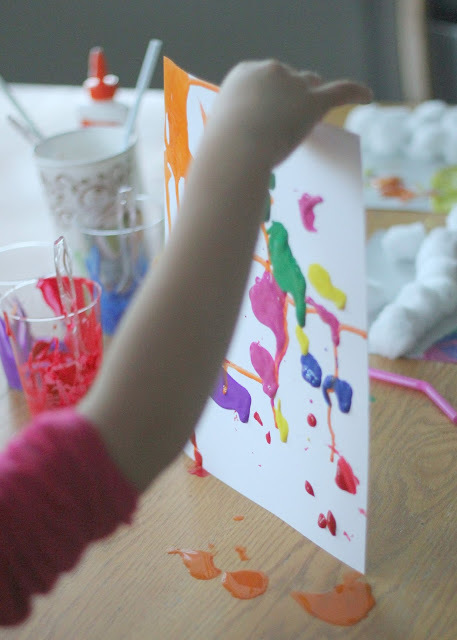 We also tried splat painting using our washable paint and a pair of nylons filled with rice. Find more details about splat painting HERE. Lastly, we tried painting on muffin tins and mini bundt cake tins and then turning them over and smearing the paint everywhere. It is so fun to watch the different prints that were made with each art tool. Have you ever tried wacky painting? 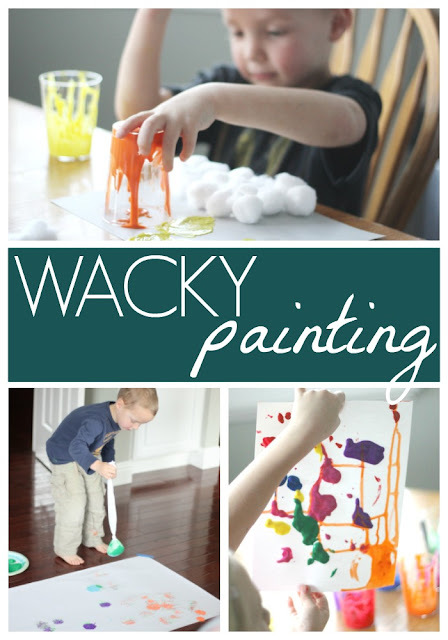 What type of painting do you consider to be wacky?? Our Virtual Book Club for Kids co-hosts are each sharing their favorite Dr. Seuss book this week along with a favorite activity. Check out the activity link below for more details. Such a fun way to paint after reading the story!